FUCKFIELD is now on flickr! Just click here! (I recommend the slideshow feature). This message will repeat itself at the end of the post. Garfield is an industry, probably a billion dollar one by now, I’m too lazy to look it up. Creator Jim Davis has a literal warehouse of “artists” drawing the strip, which he then signs off on. He spends his days wheeling and dealing to produce more Garfield crap and crappy movies. I can’t imagine who the hell is buying it all. Maybe 5 strips per year are funny. Consider yourself officially warned: Fuckfield is vicious anti-PC fun and there will be no apologies to offended parties ever. The only criterion is whether or not I laughed. 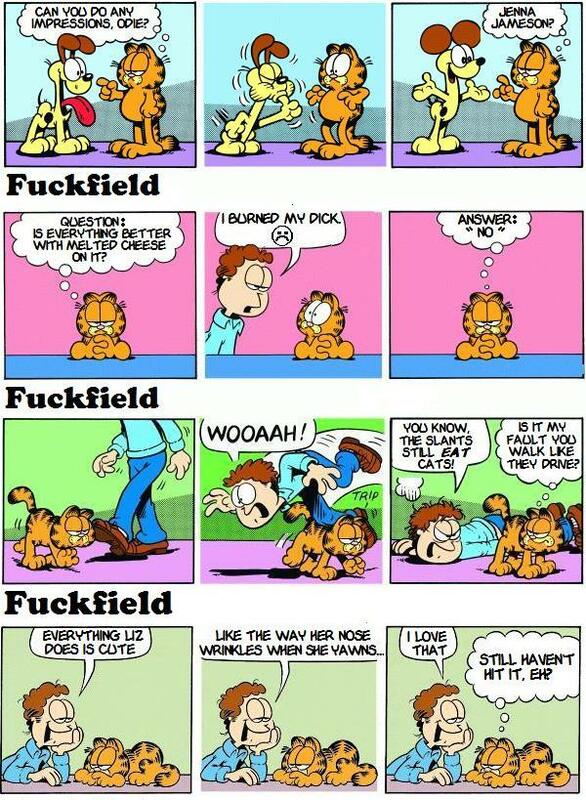 Look, I liked Garfield as a kid, but he got cruel and repetitive. My dream is to get a letter from Jim Davis’s lawyers ordering that I not publish any more Fuckfield strips. Enjoy Fuckfield. It’s a lot funnier than Garfield. If you need heartwarming, I suggest a blowtorch. FUCKFIELD is now on flickr! Just click here! Keeping its word, this message repeated itself at the end of the post.